We did, in fact, do all those things we thought we'd do last week. 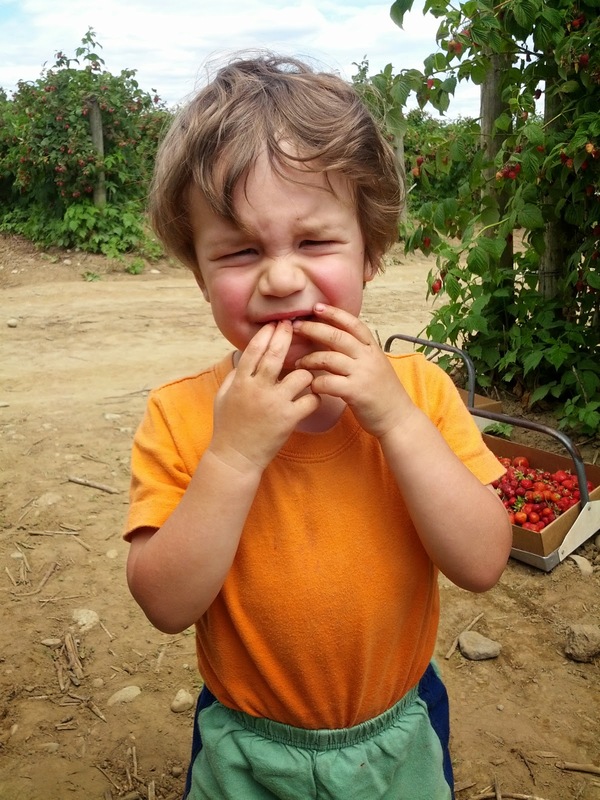 We went and helped pit cherries. It was rather chilly that day and Malcolm wasn't too happy with me wanting to pit and apparently 13 year olds are more interested in chatting than pitting, so it took longer than it should have. But it was fun and our friends gave us a jar of cherries since we came and helped. Then we had the 4th. We didn't do much, mostly hung around the house. Gareth helped me make a cherry pie from last year's jar of cherries. Then we watched the Brazil game. After that Gareth and I head across the street to meet our neighbors' new baby. He's very cute and looks a lot like his older siblings. After getting home we had some pork tenderloin and salad for dinner. My birthday was very enjoyable. I had a clarinet lesson in the morning, Ryan had a drum lesson after that. I rode the bike with the boys to the store to get ingredients for dinner/dessert. I spent most of the rest of the day in the kitchen working on pie and dinner, but Gareth helped me out and it was fun. We made a triple berry cream pie. Didn't get a picture of it, but it pretty much looked like the picture on the recipe. And it was really easy and yummy. We had our friends, the Redpaths, over for dinner. Or 3/5 of them. Dad was gone picking up one kid from the airport, but the rest of us enjoyed a delicious dinner, conversation, and pie. I wasn't sure how it'd all go. Ryan and I are quite introverted typically and almost never invite people over, so this was way out of our comfort zone. But everything went smoothly and we all enjoyed one another's company. They brought me a 1983 port - Ryan was struggling with the idea of ever drinking it when it's older than I am. Seems sacrilegious or something I guess. We've put it away for now (apparently it's meant for cold weather - I have no idea why). After they left we got Malcolm to bed and let Gareth stay up for presents. Cards Against Humanity from my sister and brother-in-law. What are supposed to be the best ever tea infusers from Ryan, as well as a Kindle. Gareth is super-jealous that Ryan and I both have Kindles now and he doesn't. He requested one be added to his wish list in hopes of getting it for Christmas. 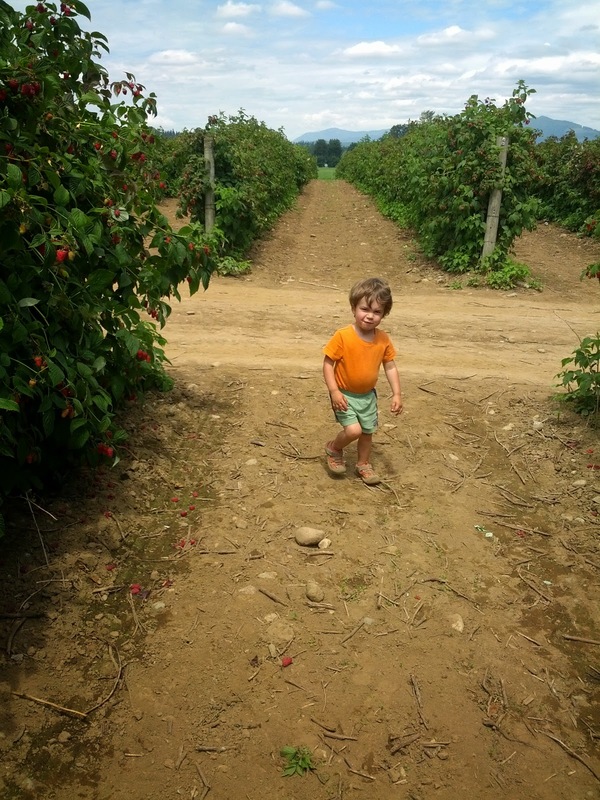 Then on Sunday we headed north about an hour to pick berries with one of Ryan's coworkers. We weren't expecting to get any strawberries, but we got there and found out they had a few left. It was difficult to find good ones, but we ended up with a good haul anyway. 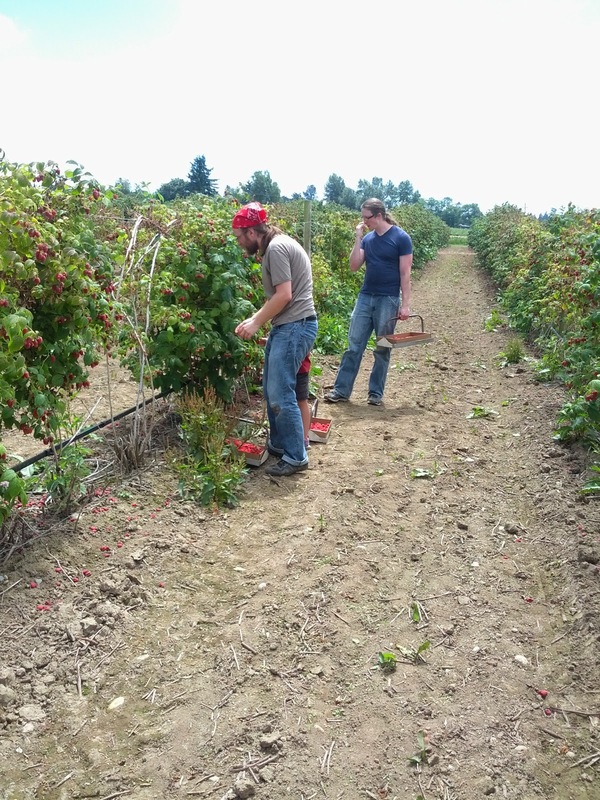 Picking the raspberries was much easier (no bending over and perfect time of year so they're plentiful). 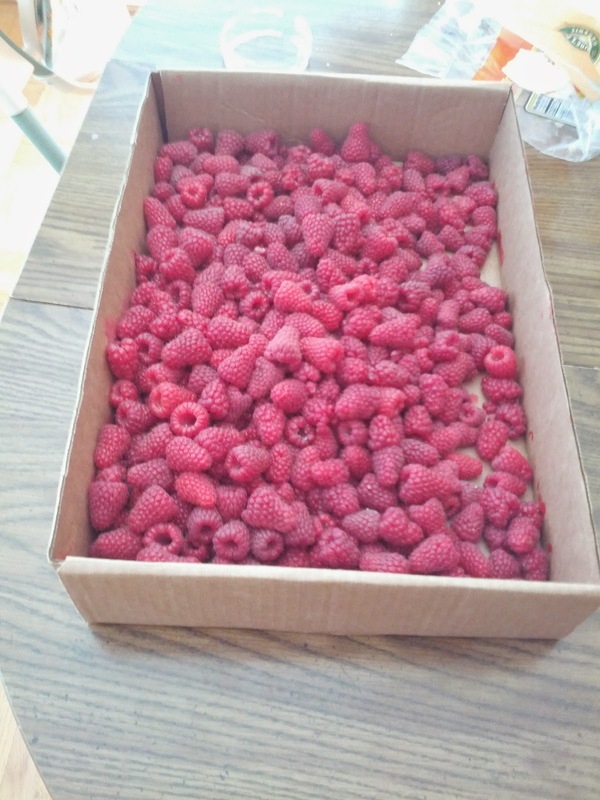 We got two boxes of raspberries and one of strawberries. Malcolm whined and cried quite frequently, but did occasionally enjoy munching on berries and loved seeing the tractor go by carrying more people out to the strawberries. When we got home we got the kids cleaned up and ate and then I ran out to the store in search of pint and half-pint jars. Turns out that lots of people buy canning stuff this time of year. The first store had just a few cases of pint jars left and at the second store the pint jars were plentiful, but I got lucky and got the very last case of half-pints. Jelly jars were completely gone. The guy I talked to there said he'd told them to order more but the managers had scoffed at him and didn't think they'd need so many this time of year. Anyway, I headed home and then we got to work making strawberry bounce. Really easy and will be ready around Christmas/New Years. I felt a bit bad using all the strawberries for adult beverage (though Gareth really didn't pick all that many strawberries), so I made sure the kids got some to snack on while we were working. Fresh-picked strawberries are so yummy; it's been way too long since I've had some fresh like that. After dinner we moved on to raspberry bounce. 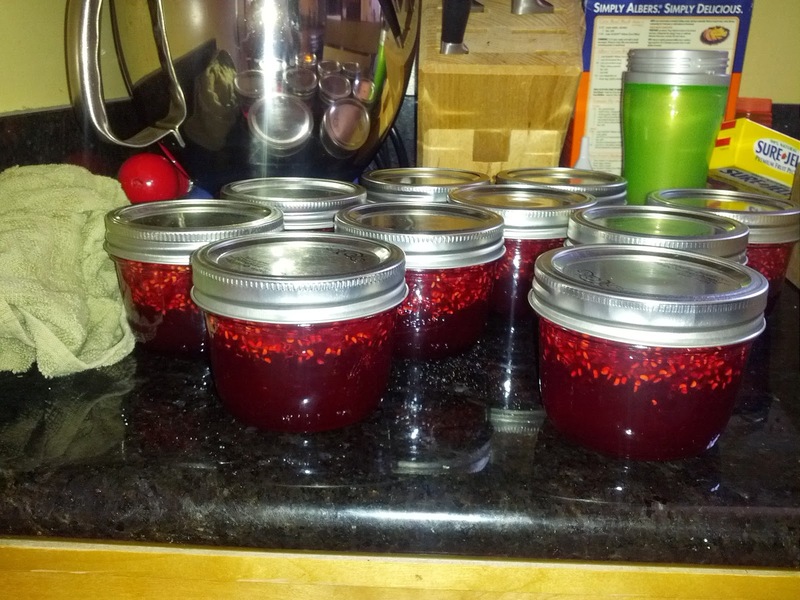 We filled our pint jars and our 3/4 liter jars that his coworker had given us and still had tons of raspberries left. I had known this would happen, so had also purchased the half-pints and pectin in order to make freezer jam. Gareth and I made that on Monday and got 10 half-pints. Could've made two batches of that with how many raspberries we had, but we were doubtful about our ability to store so many jars, so we just did the one batch. We all snacked on raspberries through the rest of Monday and I used the rest to make some raspberry smoothies yesterday. Exhausting, but very fun week/weekend. This weekend I get to make an unexpected trip to Utah for my Grandpa's funeral. A little surprising, but we knew such events were going to start happening sometime in the near future. It'll be a very brief visit, but I'm excited to see some family and especially my cute nephew and niece! Saw your Uncle Lloyd at a family gathering Kevin organized. He found some old films that Grandpa Russell Layton had made in the 50s, so we watched some of them and ate popcorn and hotdogs. Lloyd is responsible for making copies for any of you who are interested. Yes, Myrna, my mom's dad. He was 82, so he'd had a good life. And, honestly, I'm glad he was able to go quickly rather than having the long, slow decline I was expecting he'd have since he had Parkinson's. Ha, yeah, Susan. We took a while before we tried it. And we're our usual selves about it - super responsible and careful. We both have a very hard time understanding how people can drive drunk, for instance, because we both are hyper-aware of exactly how the alcohol is affecting us when we're drinking. So it's weird to think that other people aren't as aware. Also, why does anyone ever get puking drunk?? This I cannot figure out. Or even hangover drunk. Why would you do that to yourself? !